The Global Village Platinum PC Card or the Platinum Pro PC Card is the ideal modem to make your PowerBook computer a truly mobile solution. The Platinum PC Card is so easy to use that you can master its use in mere minutes. The modem comes with Global Village’s GlobalFax 2.5 fax software, GlobalFax OCR (character recognition software), and PC Card Enhancement software that helps your modem interact with your application software and your computer much easier. In addition, you will love the Quicklauncher utility which provides easy access to all your Internet and communication software. The Platinum PC Card is a type II PC Card and plugs into either PC Card slot on the side of your PowerBook. Then you plug in Clyde, a small connector that easily plugs into the end of the PC Card and has slots on the other end to connect to your phone line or Ethernet (Platinum Pro PC Card only). Just plug one end of your phone line into Clyde and the other into the nearest analog phone jack and you’re off and running. Once you have installed your Internet software, you have only to add your dialer program to the Quicklauncher to make connecting to the Internet quick and easy. The Quicklauncher is accessed by double clicking the PC Card icon. Not only can you access up to 9 applications using the Quicklauncher, but you can then select one application as your default application. You can then launch the default application by option double clicking the PC Card icon. This feature is great; I just selected my Internet dialer as the default application and with an option double click, I am ready to connect to the Internet. Faxing with the Platinum PC Card is just as straightforward. Just open any document in almost any program, hold down the option key and select the Fax command from the file menu. You are then presented with the Send dialog box that contains your customized address book, control and editing of your cover sheets, and complete control over the quality of the Fax. You can select one of your stored numbers or type in a new one, click the send button and your fax is on its way. You can set up to three dialing locations and you can even use your credit card to place the call. The Platinum Pro PC Card gives you the ability to connect to your office Ethernet network and simultaneously use your modem. This is very handy if you have access to a hub based Ethernet system. You must connect using twisted pair Ethernet cable which requires a hub, so you can’t just connect directly to another Mac unless you use an additional device such as the Farralon Etherwave connector. The one drawback to the system is in dealing with digital phone lines. Many hotels and businesses are now installing digital phone lines to keep up with increasing telephone technology. If you plug a digital phone line into the Platinum PC card you could damage the unit. This is mentioned in the documentation but is somewhat vague. You must determine if the phone line is digital or analog before you attempt to connect your modem. This is difficult to do because the phone lines look the same. The manual says to ask the hotel or business administrator but this proved to be of no help in most situations. Most hotel clerks had no idea what I was talking about. Now you’re left with no other way to find out other then buying yet another device that detects digital lines. If you do any traveling at all you will find that you really need this device, so add an additional $145.00 to the price of the modem. It would be extremely beneficial if some form of protection was included within the modem itself. Smart features like the Quicklauncher utility as well as the complete and easy to use Fax capability of the Platinum PC Card makes this modem the best choice for the PowerBook 190 or 5300 computer. The Platinum PC card was developed especially for these computers and it shows in the compatibility of the hardware and software. Installing the PC card in the computer is a snap and the software is flawless. After using the Platinum Pro PC Card for these few weeks, I could not imagine being without it. If you don’t have the need for the Ethernet capability you can save quite a bit of money with the Platinum PC Card. 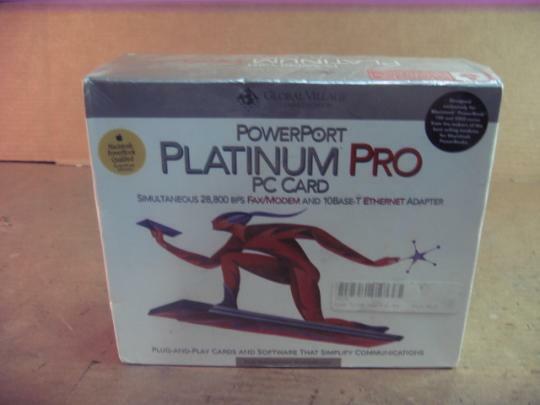 The PowerPort Gold PC Card (14,400bps) is even less money if all you need the modem for is faxing, but if you plan to connect to the Internet at all then you will want the 28,800bps speed of the Platinum series.